How do you remove all confusion? "The last screen on the course ask that we click an “X” in the upper right hand corner. There is no “X” to click to get credit for taking the course, unless you mean the “X” that closes the page." 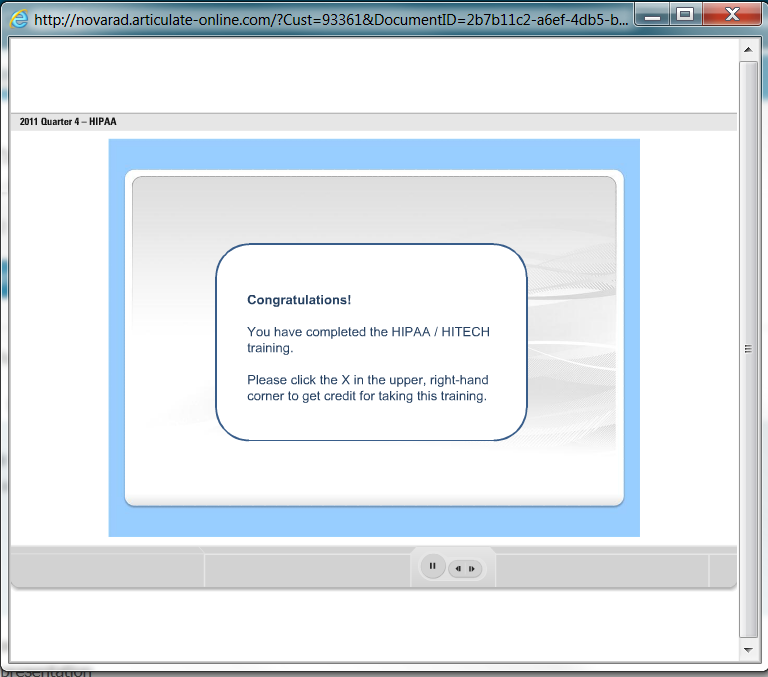 Here is a screen shot of the last screen of the course, is there something better I should be doing? "Your score will be recorded when you close this window." maybe add a big animated arrow that points to the X with some text that says click here to close the course. Applause video - okay this video is one I used more than any other conclusion screen. Do a search on iStock for "clapping". Seriously, clients always liked this one. You'll probably want to skip the "Exit Here" label. That didn't go over so well. 50/50 isn't bad. Ferris Bueler - always a classic sign off. If you find a client who embraces Creative Commons and likes 80's John Hughes movies, you're set. David you are killing me. As a product of the 80's the Ferris Bueler ending is hilarious! I think I may be using that soon. haha! Thank you for the witty responses. I was trying to be sensitive with my question, but what I really want to know is how to stop getting the "duh" questions Any tips or tricks you guys have for making a presentation intuitive would be greatly appreciated. "Close this window to exit the course"
Good point, Phil. I have to keep that in mind when designing myself. I wonder if you can truly ever get away from the "Duh" questions. Our joke is "as soon as you make it idiot proof, they'll invent a smarter idiot." In my world, we have taxpayers from 17-80+ so we're dealing with all computer knowledge levels (or none in many cases). It is an extremely sensitive issue. What about adding an FAQ/Attachment with the most commonly asked questions and answers to minimize your involvement? I've always used the "Close this window to exit the course" option, but after seeing the Ferris Bueller option, I'm re-thinking my tactics. Hey David - where do we get the Ferris Bueller video? That's classic and a lot of fun! How do you direct passengers to the Exit? You use a pre-exit sign! @ David ~ WOW! This made me crack up! When I'm in the class room and am explaining to the employees about the direction of on-line training for our company, I quite often say, "Don't worry. It won't be death by Power Point with the teacher's voice from Ferris Bueler's Day Off." To which I then mimic saying, "Bueler... Bueler..." AND - The Exit Exit signs are awesome!! 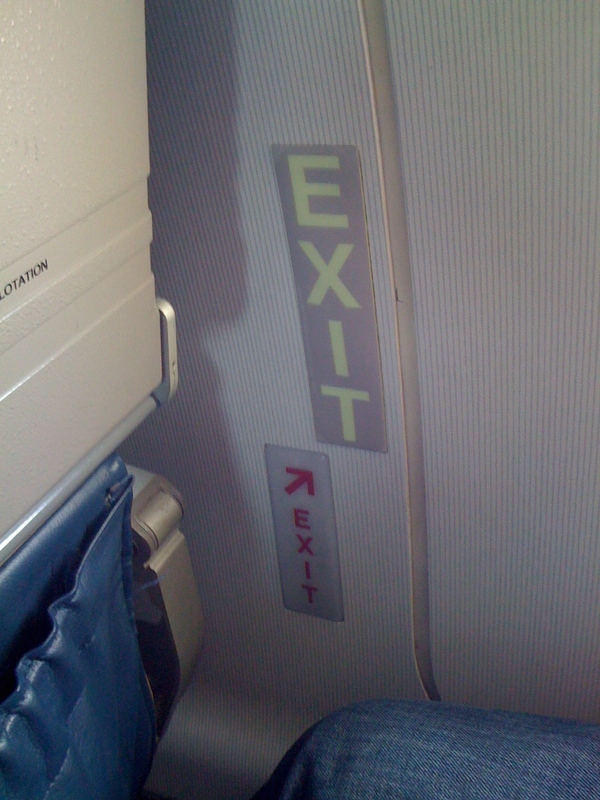 I'm in the aviation industry and there's probably a requirement for a placard with red writing to indicate the exit. @ Rachel ~ Sorry to say that an intuitive screen probably won't address all levels of "duh" thinkers. I find though that instead of asking the student with "Please..." I put the ball in their court to take action with ~ "To receive credit for the course, close the browser window by clicking on the X in the upper right-hand corner." Awesome comments! Thank you so much. You all made my day. @Clare, unfortunately, this is a small company and they all know my email address. I can't hide. @Heidi, I work at a software company. We have really smart idiots around here. @Phil, I didn't even think about other OS users. We are required to purchase the same laptops around here, but we do have some rogue sales people that can't let go of their Macs. So thanks for the tip. @David, I am totally using the Ferris Bueler exit page. Also, the Exit - Exit sign is probably the funniest thing I have seen all day! Thanks for the laugh. "How about: "Your score will be recorded when you close this window."" "Awesome comments! Thank you so much. You all made my day. @C..."